Don't you just love it when one of your favourite brands launches a new product?! 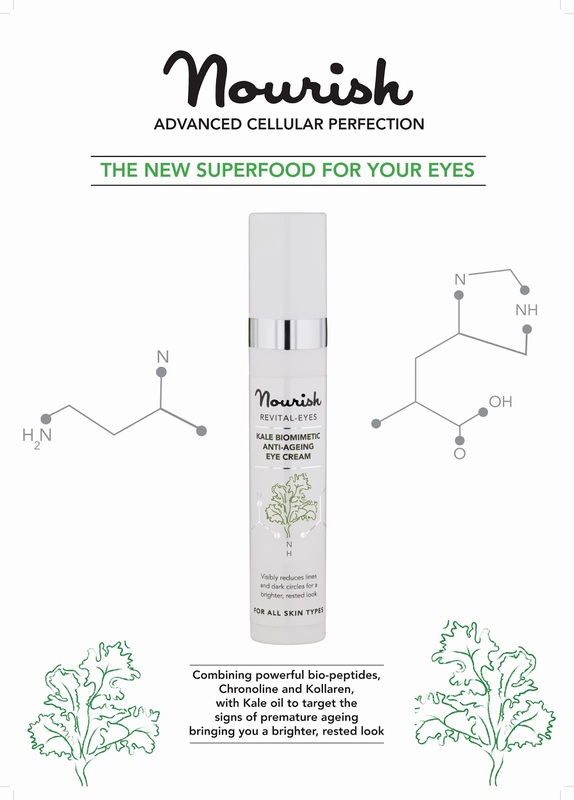 Well, it's exciting to spread the word that Nourish have released their new product: Revital-Eyes Kale Biometric Anti-Aging Eye Cream. Ok firstly, I'm seriously into eye creams of late and secondly I adore kale, I eat it non stop, its just so tasty and good for you. So kale in beauty care...errm yes please! Oh and thirdly, you have got to love a product with a good ol' bit of word play in its name eh?! So a little info about this sweet and very stylish looking product. Nourish have formulated this eye cream with oil based Kale extract, Yeast and Tonka Bean extracts and anti-oxidants, vitamins B and E plus peptides and enzymes to help with dark circles, puffiness, redness and even crows feet. The eye cream is designed to be brightening and anti-aging, boosting the skins natural elastin, as well as to protect and repair the eye area. Another power ingredient that is packed into this eye cream is tetra-peptide 3. Tetra-peptide 3 (an amino acid that is said to boost collagen in the skin) is apparently clinically proven to reduce the appearance of fine lines and wrinkles in just one month (28 days) so you can see why this is targeting those crows feet! Aditionally this cream also contains bio-peptides Chronoline and Drieline which help treat and prevent internal cellular metabolism mechanisms which can cause premature ageing! It is also 79% Organic! And there is so much more to this cream. You can read in-depth about the wonders of this on the Being Content blog! 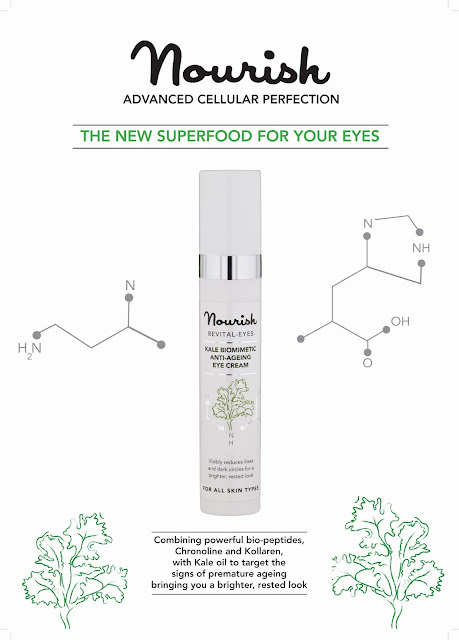 Nourish Revital-Eyes Kale Biometric Anti-Aging Eye Cream is available exclusively at Being Content throughout october until it launches nationwide on 1st November 2013!